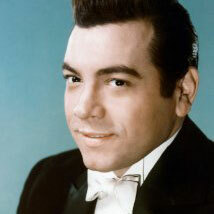 Dubbed by Arturo Toscannini "the greatest voice of the 20th century," Mario Lanza was one of America's most successful singers and movie stars in the years immediately following World War II. Born Alfredo Arnold Cocozza on January 31, 1921 in Philadelphia, he was the son of Italian immigrants, adopting his stage name from the masculine form of his mother's maiden name, Maria Lanza. From the age of 15, he studied to be a professional vocalist, later signing to Columbia Artistes Management as a concert singer; however, his career took a left turn in 1943, when he was drafted into the U.S. Army. Billed as "the Service Caruso," Lanza performed for his fellow infantrymen and also sang in the production Winged Victory; upon his return from duty, he relocated to New York, where he performed concert dates and appeared on radio. One of his audition tapes found its way to MGM's Hollywood studios, and after MGM chief Louis B. Mayer subsequently saw Lanza perform live, he signed the singer to a seven-year contract. After making his first - and final - appearance on the professional opera stage in 1948 in the New Orleans Opera's production of Madame Butterfly, Lanza made his MGM debut the following year in The Midnight Kiss, scoring a hit with the soundtrack's "Celeste Aida." The Toast of New Orleans followed, launching his first million-selling hit, "Be My Love." In 1951 Lanza starred as his idol in the biopic The Great Caruso, scoring another million seller with "The Loveliest Night of the Year." In 1951 he mounted his own CBS radio series, and the following year starred in Because You're Mine; the title song, penned by Sammy Cahn and Nicholas Brodszky, earned an Academy Award nomination, and became Lanza's third and final million-selling effort. After completing the music for the MGM production of The Student Prince, Lanza walked out on the project; by allowing the studio to retain rights to the recordings, he was able to avoid a breach of contract lawsuit, with the single "The Drinking Song" rising to the top of the U.S. charts. In the wake of his walkout Lanza became a recluse, disappearing from the limelight for over a year while battling addictions to food, alcohol and tranquilizers; he also faced a series of battles with the IRS. Finally, in 1956 he resumed his film career in the Warner Bros. production Serenade; however, the next year, disillusioned with American life, he moved to Italy, settling in Rome to star in 1958's The Seven Hills of Rome. That same year Lanza toured the U.K., making one final film, For the First Time. He died on October 7, 1959; while officially recorded as a heart attack, his passing was later rumored to have been a Mafia hit ordered following his refusal to perform at the request of mob boss Lucky Luciano.